The Centre for Technology Management (CTM) has been exploring the impact of the emergence and diffusion of 'digital fabrication' technologies (which includes processes termed ‘additive manufacturing’ or ’3D printing’) on businesses. CTM has recently completed two projects - summarised below - that have explored different aspects of this topic. If you would like a basic introduction to the core concepts underpinning 3D printing/additive manufacturing and their potential impact, please see the videos below. Digital fabrication is thought by some commentators to be underpinning a potential manufacturing revolution. Covering a broad range of technologies, digital fabrication offers the prospects of on-demand, mass personalisation, with more localised, flexible and sustainable production. These technologies have the potential to disrupt the organisation of manufacturing and the ways in which companies – both incumbents and new entrants – create and capture value. However, digital fabrication has attracted significant attention in the last year to the extent that there is danger of it becoming overhyped. It is therefore very timely that research be undertaken that considers the interconnected technological, commercial and policy issues that characterise the emergence of digital fabrication. This will provide the academic, industrial and policymaker communities with responses to the most pressing questions, and a structure for on-going debate and knowledge sharing. Our objective is therefore to develop cross-disciplinary research capability that allows us to: (1) address key research questions relating to the emergence of digital fabrication and its impact upon the UK economy, and (2) deliver an enduring cross-disciplinary research platform for responding to future digital economy-related research challenges. How will digital fabrication affect the manufacturing landscape? What impacts will this revolution have on manufacturing in the UK? How can UK firms become global leaders in this new age of digital manufacturing? 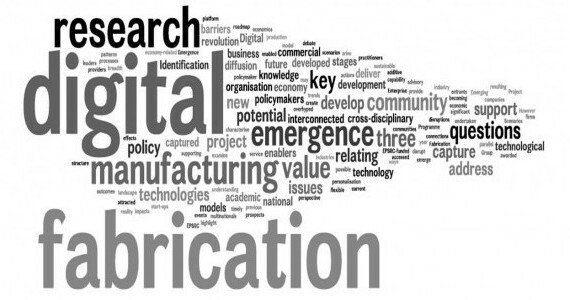 Determination of the effects of digital fabrication on the organisation of manufacturing in the UK. Assessment of how and where value will or could be captured in the UK. Identification of key support actions necessary by UK policymakers to underpin value capture resulting from digital fabrication in the UK. Emergence: How did digital fabrication emerge? Identification of trends, patterns, barriers and enablers in the emergence and diffusion of digital fabrication to date. Business model disruptions: How is value captured from digital fabrication technology? How has value capture changed? What traditional/disruptive business models have they enabled? Scenarios: What future scenarios that may result from the diffusion of digital fabrication technologies? What will be the possible associated business models, their barriers and enablers? Running in parallel with and supporting these three research stages will be the development of a community that will bring together academic perspectives (from technology, management, economics and policy), with those of practitioners (from start-ups to multinationals, and support service providers) and policymakers. This community will be developed through events run throughout the project. To help develop this network, we have assembled an advisory group that provides us with the appropriate breadth to ensure that relevant stakeholders can be accessed. The project started in October 2013 and was completed in early 2017. For further information on this project, please contact Simon Ford, Letizia Mortara or Tim Minshall. Outputs from this project and digital fabrication trends can be accessed via https://twitter.com/dfab_info and the project blog http://capturingthevalue.wordpress.com. To join the growing community of interest around this topic please go to the Bit by Bit 3D Printing Interest Group on LinkedIn. Phaal, R., E. O’Sullivan, M. Routley, S. Ford and D. Probert (2011). “A framework for mapping industrial emergence.” Technological Forecasting and Social Change 78(2): 217-230. “Defining the research agenda for 3D printing-enabled re-distributed manufacturing” (3DP-RDM) is a new 2-year project that contributes to the EPSRC’s “Manufacturing the Future” theme, and which is being funded through the EPSRC/ESRC’s recent “Re-distributed Manufacturing Call for Networks“. The project is led by Dr Tim Minshall (PI) at the Institute for Manufacturing, University of Cambridge, and by Prof. Phill Dickens (Co-I) at the University of Nottingham. Dr Simon Ford, also based at the Institute for Manufacturing, is the Network Coordinator. The objective of 3DP-RDM is to convene a multi-disciplinary research and multi-industry user network that provides the required breadth and depth of research capabilities to define and disseminate the research agenda for 3D printing-enabled re-distributed manufacturing. The first stage in this process was a scoping workshop on 30th January 2015 at the IfM, with the objective of the network being to fund 4-6 feasibility studies across the two years of the network. A competition in 2015 will lead to 2-3 feasibility studies being conducted, with this competition replicated in 2016. Further details about the 2015 feasibility study competition can be found on our blog.